A few of the biggest companies in sports are launching a live-streaming network designed for your devices, not your TV. 120 Sports launches its live original programming Wednesday at 6 p.m. ET, but you won’t find the network bundled in your cable package. It’s a Web platform and iOS app powered by MLB Advanced Media that counts the MLB, NHL, NBA, NASCAR, Silver Chalice, and Time Inc. as equity investors. 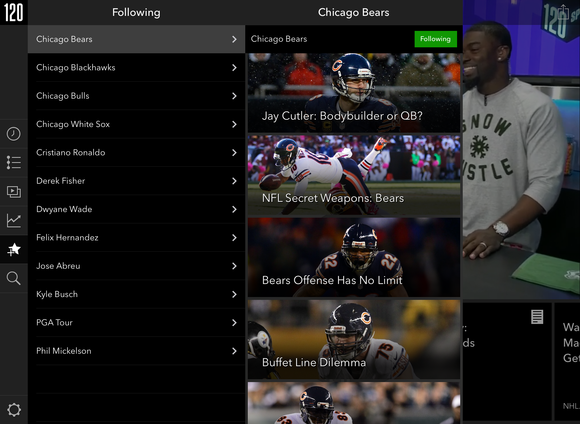 That means 120 Sports anchors will be able to offer live looks and in-game highlights for the biggest games on TV, as well as integrate Sports Illustrated content into the app. Collegiate conferences are included thanks to a Campus Insiders partnership. The network’s content is a little different from your stereotypical sports programming. 120 Sports has anchors and analysts on tap, but instead of lengthy looks at sports topics, each 120 segment will last exactly 120 seconds. Former ESPN anchor Michael Kim, Super Bowl champion Bryant McFadden, and a roster of commentators will lead you through the day’s sports news. 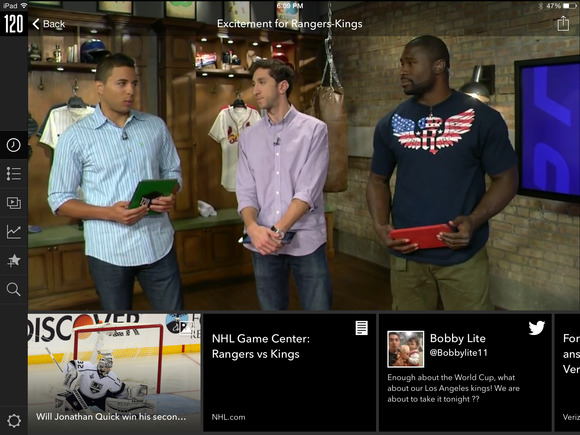 120 Sports is designed with mobile devices in mind. 120 Sports President Jason Coyle said during a Monday app demo for press that the content is “moving at the speed of Twitter,” with anchors jumping from story to story and topic to topic. Social media will drive much of the network’s discussions—if a big play or breaking announcement starts trending, 120 Sports will pick it up instantly. The app, now available on iTunes, features a gridded timeline with stories that you can swipe left and right to move through. When you tap to watch a video, data cards on the bottom will highlight photos, tweets, scores, and thanks to heavy integration with the new relaunched SI.com, Sports Illustrated stories. You can search through segments by athlete, team, or sport, or you can choose from a Trending column that shows you popular topics. You can follow a topic and receive push notifications if another segment is created. Live segments become on-demand videos within minutes. Sharing videos is simple with options to share on Twitter, Facebook, via email, or by texting a link. The app is designed for sports fans to “snack on video and highlights all day long,” said Todd Larsen, Time Inc’s executive vice president. 120 Sports is also planning deep fantasy sports coverage with segments geared toward what fantasy sports fanatics need to know to win. For now, the network will only be live from 6 p.m. to 2 a.m. ET, though eventually it will run all day, every day.